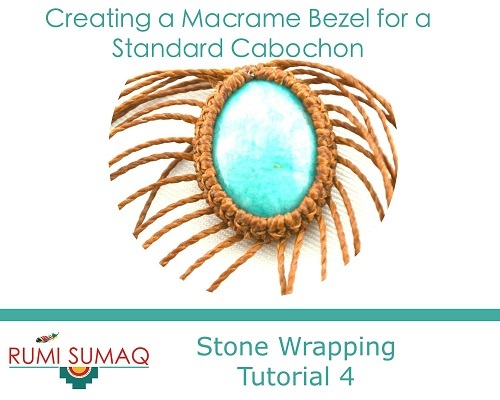 Last week's giveaway for 5 of Rumi Sumaq's Macrame Stone Wrapping Tutorials certainly brought back some memories. Suzanne Grabber wrote, "I know the basics of macrame from making plant hangers and the ole owl wall hangings way back when. I don't seem to be able to make those skills transfer over to jewelry other than the simplest on my own." Indeed, knotting and wrapping around a slippery cabochon takes micro macrame to a whole new level. So it helps to get help from a pro like Coco Paniora Salina. The winner of this giveaway will receive all five tutorials as a bundle. There can only be one winner so if it's not you, get the bundle quick from Rumi Sumaq because at some point, it will become unbundled and will cost more! If you want to save on this bundled offer, here is the 20% discount code! I numbered all the eligible entries and got the random number generator over on random.org to pick the winner. So congratulations, Tania Loyo! I do not have your email so please contact me asap (before Monday) to claim your prize.